A CNA will be performing various skills when caring for residents or patients such as measure and record a resident’s respiration. This task is an important part of healthcare as it helps track the patient’s current health condition and also measure their progress. A nurse aide is an important part of a nursing facility as they provide some of the direct healthcare services that are administered to patients. If you are one of these healthcare services workers, it is important to follow the right steps in administering this task in order to provide the best services. This process involves measuring the number of breaths that a resident or patient takes for one full minute. It is done separately from the recording a patient’s pulse rate and this allows the CNA to inform the patient to tell him or her that it is the patient’s pulse which is being taken. This is to avoid the possibility that the patient would be altering or changing his breathing patterns to gain a worse or better respiration count. You have to prepare the Measurement Form and have it with you before taking the respiration count. The first step is to greet the patient and to introduce yourself when you enter their room. Make sure to address them by their first name and not by any nickname that you may have known or invented for them. Explain to the resident why you are there as well as the steps that will be taken for procedure. Remember that you have to tell the patient that you will be taking their pulse and not their respiration rate in order to prevent them from manipulating their breathing patterns. Measure the patient’s rate of respiration without telling them how to breathe and giving them any insinuation that you will be counting their respiration. 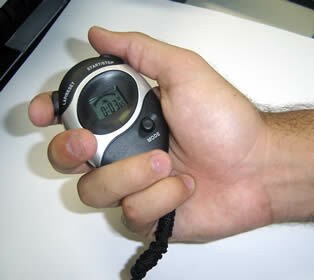 Measure their respiration for one full minute and then record the patient’s respiration rate on the Measurement Form. This should be indicated in a scale of + or -2 respirations based on a nurse’s measurement. Make sure that you take the resident’s needs and preferences during the whole procedure. Ask them if they are feeling comfortable with how they are positioned and that they are on a safe position on the bed or chair that they are in. This should be done before and during the whole time when you are taking the patient’s respiration rate. Make sure that you have taken all the necessary steps for standard precaution procedures as well infection control when you are measuring the patient’s respiration. This is to help preserve the health of the infection and prevent the spread of communicable disease. Ask the patient about his comfort and his preferences or needs during the procedure. Make sure that you have also conserved the patient’s rights to privacy as well as to independence by taking their preferences into consideration. Preserve the patient’s safety by placing them in a secure position in the bed or chair while you are administering respiration count.